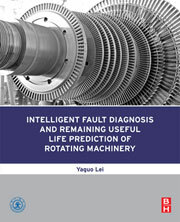 Intelligent Fault Diagnosis and Remaining Useful Life Prediction of Rotating Machinery provides a comprehensive introduction of intelligent fault diagnosis and RUL prediction based on the current achievements of the author's research group. The main contents include multi-domain signal processing and feature extraction, intelligent diagnosis models, clustering algorithms, hybrid intelligent diagnosis strategies, and RUL prediction approaches, etc. This book presents fundamental theories and advanced methods of identifying the occurrence, locations, and degrees of faults, and also includes information on how to predict the RUL of rotating machinery. Besides experimental demonstrations, many application cases are presented and illustrated to test the methods mentioned in the book. This valuable reference provides an essential guide on machinery fault diagnosis that helps readers understand basic concepts and fundamental theories. Academic researchers with mechanical engineering or computer science backgrounds, and engineers or practitioners who are in charge of machine safety, operation, and maintenance will find this book very useful.